WAY TO VIEW AN ECLIPSE! Witnessing a solar eclipse is truly a magnificent and memorable experience for anyone lucky enough to have the opportunity to observe this extraordinary event. While this is an amazing sight to behold, looking directly at the Sun without proper eye protection can cause serious and permanent eye damage. Our solar eclipse glasses are designed to protect the wearer's eyes by filtering the harmful Ultraviolet and Infrared energy emitted by the Sun as well as blocking most of the Sun's intense visible light. The incorporated premium lens material utilized in our eclipse glasses is CE Certified by the British Standards Institution and meets transmission requirements for European and Australian / New Zealand Standards for eclipse eye protection. 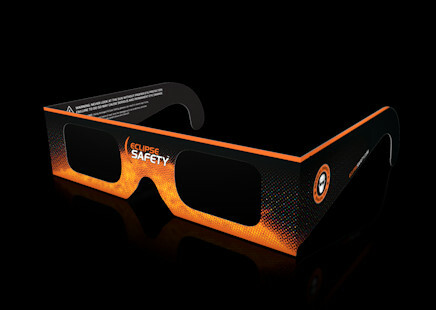 Eclipse Safety Glasses offer a safe, easy and inexpensive way for sky watchers of all ages to witness and enjoy the sheer spectacular beauty of a solar eclipse while providing invaluable vision protection. This Product Meets Transmission Requirements of EN 1836:2005 and AS/NZS 1338.1:1992 for Solar Eclipse Filters - Queensland Approved. 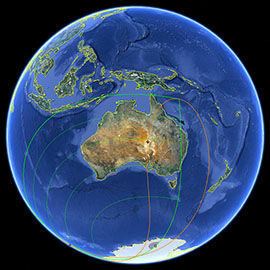 be viewable across Indonesia, parts of Australia and areas of the Pacific Ocean. In most parts Indonesia the eclipse will be visible in the early hours of the morning as the moon's shadow races across the country from the West to East Coast. Observers will need to wake early as the Total Eclipse will begin at 7:20 AM and end at 9:31 AM local time! 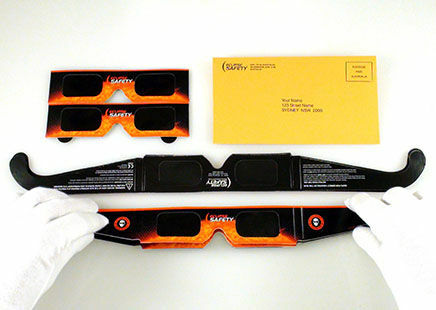 Eclipse glasses must be used at all times. At no time can you view this type of solar eclipse without appropriate eye protection as the sun will not be totally obscured. 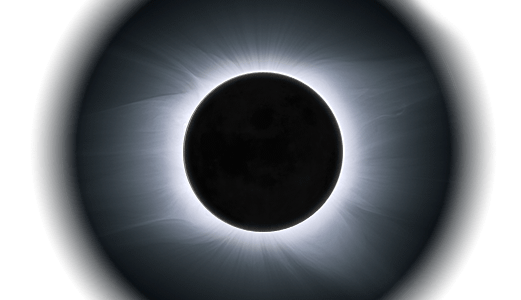 The Sun's intense bright light is fully obscured by the dark silhouette of the Moon to reveal the Sun's much fainter but spectacular outer atmosphere known as the corona. The Sun and Moon are not exactly aligned and the Moon only partially obscures the Sun's light. This phenomenon can also be observed outside the track of a Total or an Annular eclipse. The Sun and Moon are in line, but the apparent size of the Moon is smaller than the Sun, which results in a very bright ring surrounding the dark disk of the Moon. This rather rare type of eclipse shifts between a Total and an Annular eclipse along different sections of the eclipse’s path as it travels across the Earth. WARNING: Never look directly at the Sun without proper eye protection. Never look at the Sun through any optical devices such as telescopes, binoculars or cameras without appropriate solar filters. Failure to use suitable protection can result in permanent eye damage. Sunlight is intensely powerful, even with 99% of the Sun's surface obscured by the Moon; the remaining 1% of sunlight contains a considerable amount of energy that can cause serious harm to your eyes. 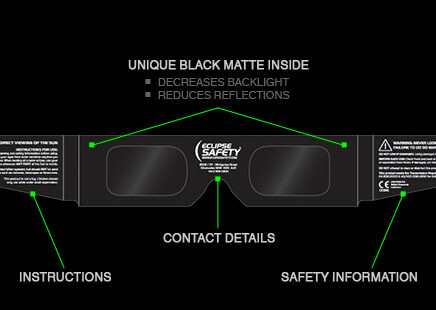 The protection of your vision is paramount, thus our CE Certified eclipse glasses are designed to meet exacting transmission requirements of European and Australia / New Zealand Standards for eclipse eye protection to ensure your utmost safety. 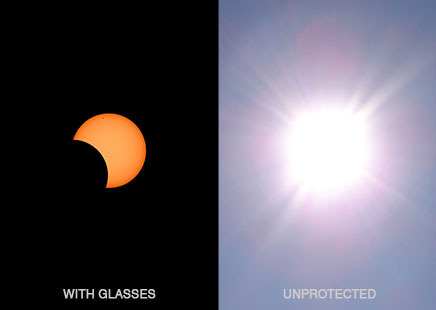 Eclipse Safety glasses are a safe, easy and inexpensive solution for solar eclipse viewing whilst providing the wearer with the highest levels of eye protection from the Sun's intense energy. The following graphic illustrates the predicted track of the Moon's shadow across the Earth's surface for the impending solar eclipse. Copyright 2016 © Eclipse Safety - All rights reserved.